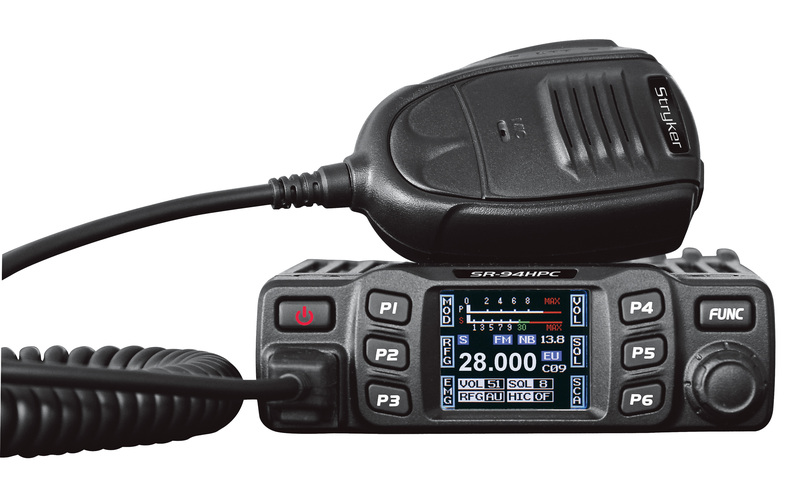 The new SR-94HPC 10 Meter Radio offer advanced features, customizable settings, and 45 watts AM PEP in a remarkably small chassis. The wrap around cast aluminum heatsink does an excellent job at dissipating any heat that�s generated during transmit. The SR-94HPC features a full-color TFT display. The clarity of the screen allows you to read it even if you are quickly glancing at it while driving down the road. You can choose what you want to show on the screen (features, functions, frequency, voltage, S units and more). There is a total of 6 push buttons around the screen (P1 � P6). Each button is assigned to a function; for example microphone gain or rf gain. Part of what makes the SR-94HPC unique is you can customize what feature or functions that you use most frequently. Future accessories for the SR-94HPC include a Wireless Bluetooth microphone and Smart Phone App that connects to the radio via Bluetooth. Now that is what we call innovation! The SR-94HPC is the perfect radio for an amateur that enjoys talking on 10 Meter FM Repeaters. With the optional CTCSS board, the SR-94HPC has 38 CTCSS tones, 104 DCS tones, and repeater offsets (+ or -). The power output vs. physical size of the radio is what will surprise many of you! This much power is usually only available in a full-size DX chassis. We managed to utilize three FQP13N10 final transistors for 45+ watts of PEP. Like all Stryker Radios, it has strong AM transmit audio. Measuring in at only 5.8� L x 4.8� W x 1.4� H, this radio will fit in any vehicle, regardless of size. Never before has full featured, high power radio been available in compact chassis. With clean, modern styling, the SR-94HPC looks great in any vehicle. The PCB & frame are exceptionally rugged, on the road, off the road or no road, the SR-94HPC can take it without any problem. Small Size: L 5.87" x 4.75" x H 1.5"